Seven area contractors responded to a call for bids to demolish the existing Lion building and perform major grading of dirt for the new football field and track complex to be constructed at Jones Park. Gary Holler, of Shaffer, Johnson Cox and Frey Architecture, answers questions related to the project before taking bids. 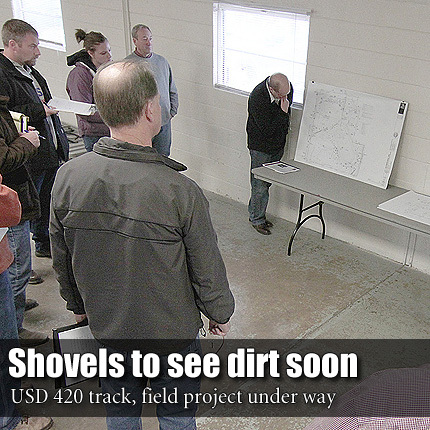 OSAGE CITY—The Osage City USD 420 Board of Education cleared early hurdles as work begins to unfold at the site for the new track and field at Jones Park. The board began existing business with a bid to address issues of moving power lines and removing power poles in the area for the complex. The board approved a bid for $47,571 to pay Kilian Electric for the removal of poles, as well as relocating the line at the existing field. The motion also included a $911 payment to McElroys, Inc., for a sewer camera to survey the line from the community center. Hutton distributed updated drawings from Kenton Cox, of Schaefer, Johnson, Cox and Frey Architecture, for the track and field facilities, which included a new storage space, as well as change to the arrangement of bathrooms between the existing community building and planned locker rooms. Hutton said Cox estimated a $60,000 saving with the change. Several council members expressed convern over changing plans. Board president Brian Davies and member Pat Bean responded from their experience working with the architects and McPherson Construction. Questions concerning the current status of the project in relation to the overall budget couldn’t be answered at the meeting.